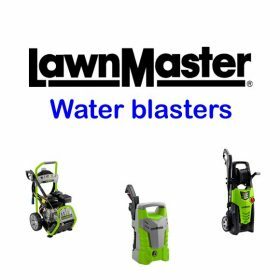 Grasslands have water blasters to make your outdoor cleaning jobs easier. Grasslands now have available a selection of water blasters for most applications. They can also be know as high pressure cleaners. We have options that include electric or petrol powered models. Whether your outdoor cleaning job is big or small, see us to help you choose the model that best suits. Some cleaning jobs just have to be done, so it important to get the right machine to help. With electric powered water blasters starting from $99.00 it does not have to cost a lot to have a useful machine to help with your cleaning jobs.